MIDDLEBURY, Vt. – Seven members of the Middlebury College faculty have been promoted to the rank of associate professor without limit of tenure. 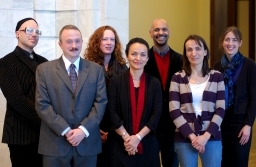 The board of trustees, at its meeting in December 2012, accepted the recommendations of President Ronald D. Liebowitz and the board’s educational affairs committee in promoting: Catherine Combelles (biology), James Fitzsimmons (anthropology), Eliza Garrison (history of art and architecture), Nadia Rabesahala Horning (political science), Kareem Khalifa (philosophy), Caitlin Knowles Myers (economics) and Lynn Owens (sociology). 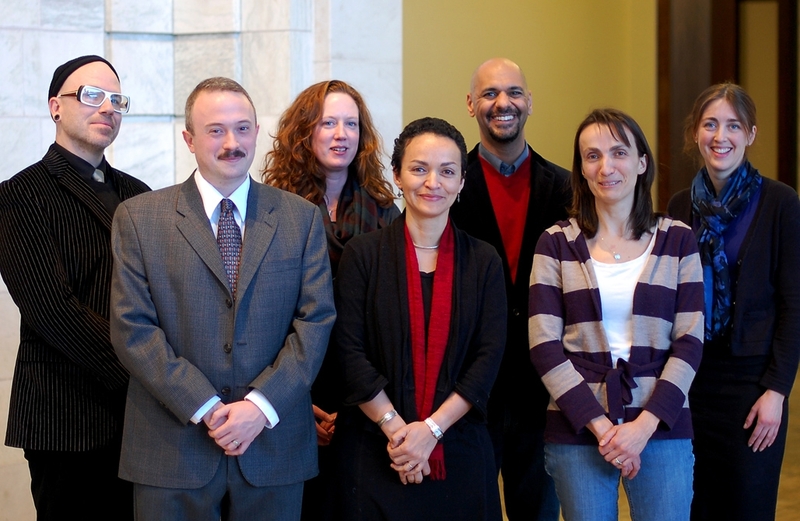 The seven promotions from assistant professor to associate professor will take effect July 1, 2013. James Fitzsimmons, who earned both his master’s and doctoral degrees in anthropology at Harvard University, is recognized as an international authority on ancient Mesoamerican culture. His book “Death and the Classic Maya Kings” (University of Texas Press, 2009) reconstructs royal mortuary rites and expands upon our understanding of Maya concepts including the afterlife and ancestor veneration. Credited for creating at Middlebury “a vital program in archaeology where none existed before,” Fitzsimmons is proficient in Spanish and Maya hieroglyphics, and has working knowledge of the Chortí Maya, Yucatec Maya and Nahuatl languages. He came to Middlebury as a visiting faculty member in 2005, and was named assistant professor in 2007. Eliza Garrison, with her research interests in the art of the Carolingian and Ottonian Empires and the historiography of medieval art, has filled an important gap in the curriculum of the history of art and architecture department since her arrival at Middlebury in 2005. Her recent book, “Ottonian Imperial Art and Portraiture: The Artistic Patronage of Otto III and Henry II” (Ashgate, 2012), is described by one reviewer as a “tour de force of research.” Garrison organizes the department’s annual Christian A. Johnson Symposium and its newly created lecture series, “Matter and Memory: Topics in Art History.” She holds a bachelor’s degree in medieval studies and history from Smith College, and both a master’s and doctorate in art history from Northwestern University. Nadia Rabesahala Horning has made critical contributions to the curriculum of the political science department, as well as to the programs in environmental studies and international and global studies, through her teaching, research, and expertise in African politics and international relations. And her soon-to-be-published book, “Conservation Politics in Africa: Forests, Farmers, and Foreigners,” is an examination of forest conservation on the community level and the national level in three developing countries: Madagascar, Tanzania and Uganda. The recipient of fellowships from the Mellon Foundation and World Wildlife Fund, Horning graduated from George Mason University (B.A. in international studies and M.A. in international transactions), and from Cornell University (M.A. and Ph.D. in comparative politics). Kareem Khalifa joined the faculty in 2006 after earning his master’s and doctorate in philosophy at Emory University. In promoting Khalifa, President Liebowitz said, “The courses you teach, from Introduction to Modern Logic to Theories of Scientific Method, underscore the importance of philosophy in a liberal arts education.” In addition, outside reviewers see Khalifa as “a scholar who is making an impact on his field” through his “lucid writing and carefully reasoned articles.” In 2012 the Northwestern University graduate (B.A. in philosophy and mathematics) was a fellow at the National Endowment for the Humanities’ summer institute on experimental philosophy. At Middlebury he has served on faculty council, community council, the diversity dissertation fellowship committee and the task force on interdisciplinary innovation. Lynn Owens is a sociologist whose 2009 book, “Cracking Under Pressure: Narrating the Decline in the Amsterdam Squatters’ Movement” (Penn State University Press), is an insightful analysis of a social movement in Europe that lost its strength. The book analyzes why the movement declined, how it occurred and what its effects are. Owens, who joined the Middlebury faculty in 2007, holds a bachelor’s in sociology from Florida State University, and both a master’s and doctorate in sociology from the University of North Carolina, Chapel Hill. The recipient of a National Endowment for the Humanities award and a Mellon Foundation grant, Owens teaches courses on social movements, sociological theory, environmental sociology, globalization and crime and deviance. In addition to granting tenure to the above members of the faculty, the board of trustees in December promoted three associate professors to the rank of professor. They are Anne Knowles (geography), Kathryn Morse (history) and Jacob Tropp (history). The appointments to full professor will take effect July 1, 2013.